Water Heater Anode Rod | Robins Plumbing, Inc.
What do you think an anode rod is? Take a guess. No, it isn’t some mysterious rod abandoned by aliens and left in the desert for an excavation team to find and take over the world with. Good guess though! An anode rod may not be an alien device that can take over the world, but it is tiny but mighty and can be the fountain of youth for your water heater. But what is an anode rod? Breaking down the word anode; an·ode ˈanōd/ noun the positively charged electrode by which the electrons leave a device. The negatively charged electrode of a device supplying current such as a primary cell. 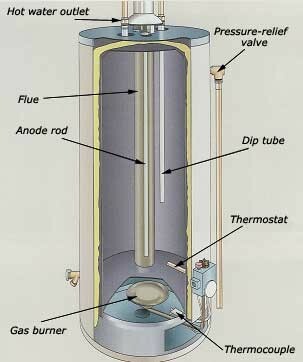 An anode rod is a rod that is in a storage tank style water heater. The anode rod serves a critical purpose for your water heater; it helps to keep it from rusting prematurely. Many anode rods are created with magnesium, or a similar material that is designed to be eaten by the water before other components of your water heater are destroyed, like the elements and the steel tank. The anode rod delivers electrons into the water that helps to create an environment that prevents corrosion. Did you know that anode rods don’t come with a warranty, even from day one of installation? Of course, you didn’t, that’s my job to know these things. Because anode rods are designed to die and be eaten by water, they do not come with a warranty from the water heater manufacturer, and yes, that is for every single brand. How long does an anode rod last? Anode rods can last several years in most water heaters, but that isn’t always the case. There are a lot of factors in play when it comes to the condition and lifespan of an anode rod, and the biggest factor is the quality of the water. The more minerals and hardness in the water the quicker your anode rod will die and the shorter lifespan you will have with your water heater. Another factor that most people don’t consider is a salt softening water system. That will also shorten the lifespan of your water heater because salt water and metal corrode even faster than regular hard water. Ask anyone who lives near an ocean, while the ocean air may smell amazing the salty, moist air will eat anything metal in no time. How about where it snows, and people salt the roads, that salty water will eat the steel on the bottom of a car in just a few cold, miserable winters. One sign that your water heater may need a new anode rod is smelly hot water. What does bad anode smell like? Hell. Seriously, it smells like brimstone coming out of your faucet – nasty! If it smells like the devil has come to visit your house, it is time to call Robins Plumbing to perform an exorcism on your water heater. Another symptom of a bad anode rod is air in your hot water line. While it may seem awesome to have carbonated hot water, it isn’t supposed to be like that and is often a sign that your water heater’s anode rod needs to be replaced. The short answer is no. Absolutely not. Don’t do it. You can watch YouTube videos if you want, you can go for the DIY repair, but I can just about promise you that you will be calling me after hours of swearing, busting your knuckles several times and making several trips the hardware store for more tools and more advice just to realize that I was right. Replacing your anode rod should be left to a licensed professional. The concept of replacing your anode rod is simple; it should unthread from the top. Let me tell you that it NEVER happens that way. Even my strongest techs wage war with anode rods to remove them. They corrode into the tank of the water heater, and if they are corroded badly enough, they can’t be removed without compromising the tank. Then there is the matter of getting the new anode rod in. The new anode rod is several feet long and feeds in from the top of the water heater. If you’ve looked at your water heater lately, there probably isn’t room, so even if you are one of the lucky ones that get your old anode rod out of your water heater, getting the new one in is a pain. When you have a new water heater installed by a licensed contractor such as Robins Plumbing you can opt to have a second anode rod installed in your new water heater. 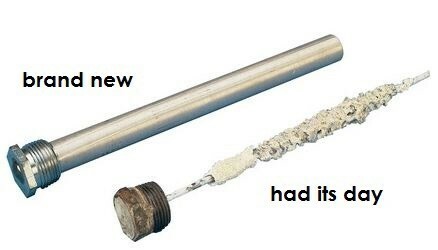 This second anode rod extends the water heater tank warranty four years and is only valid if installed by a licensed contractor during the initial installation. It can be added later as an upgrade to your current water heater to extend the lifespan of your tank, but if installed at a later date it does not extend the water heater tank warranty. Quality of anode rods varies by manufacturer and model. The brand and model that we install at Robins Plumbing come with a premium grade anode rod providing long-lasting tank protection. While most of us just consider the upfront cost of a water heater, taking a few minutes to ask why a water heater is cheaper can lead to the discovery that it is because it is built with cheap parts and it is going to last half the lifespan of the one built with higher quality parts, like an anode rod.